Where in the world is Ndutu? - click on this link to find out where. The first in what will be a series of posts with travel advice which I hope that my readers will find a font of information that will help to make travel to the world’s destinations just a little easier and more comfortable. Why go to Ndutu at all? Ndutu is probably the most southern tip of the Great Wildebeest Migration and it is where the Wildebeest will come to calve every year. It also lies between the Ngorongoro Crater and the Serengeti. 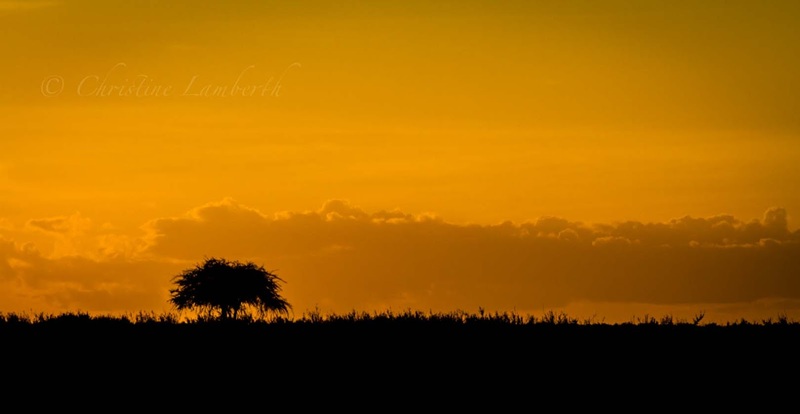 I can wax lyrical for many a day on the magic of the Serengeti and how it should really be on everyone’s bucket list. 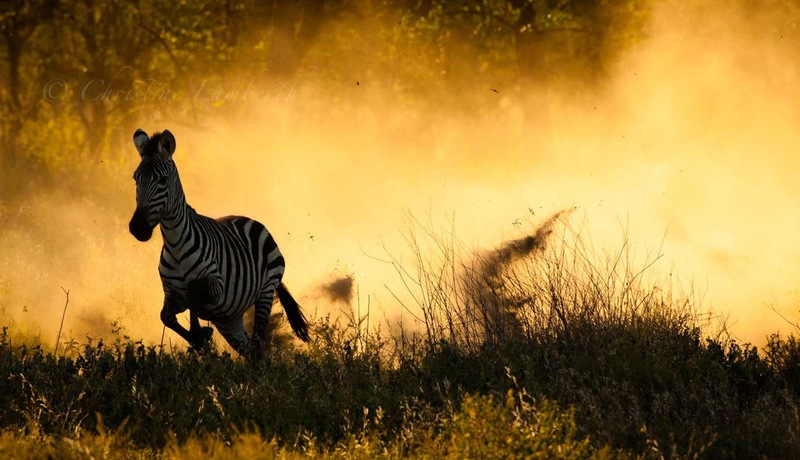 It is truly one of Africa’s remaining wildernesses where animals roam completely free. There are no fences to hem the animals in and they are left free to be the wild animals of Africa as they should be. By air you would have to fly via Nairobi, then transfer to Kilimanjaro International Airport. You can either transfer to Arusha Airport and fly into the Serengeti or you can do a road trip via the Ngorongoro Crater and onto Ndutu. Currently there are 5 flights per day from Nairobi to Kili (as it is referred to). From Nairobi Kenya Airlines and Precision Air (Tanzanian airline) fly 5 flights daily. From Europe there are only 2 direct flights - Condor fly from Frankfurt and KLM fly from Amsterdam. Other airlines that fly into Kili are RwandaAir from Kigali, ZanAir from Zanzibar, Ethipian Airlines from Nairobi and Addis Abbaba, Air kenta Express from Nairobi and Mombasa and Air Burundi from Bujumburra. You can fly from Arusha to Seronera in the Serengeti on a daily basis. www.flyezee.com can offer a selection of flights at different times of the day. The volcanic dust creates the most amazing photos at sunset. Although the international airlines have generous baggage allowances of 20 - 23kgs plus hand luggage this is not the case with the smaller charter flights. Travelling Light is the watchword for chartered flights in Africa. Baggage allowances drop to 15kg per person and sometimes could even include your carry on bags weight. Double check these allowances when making bookings. A road trip from Arusha heading out towards the Serengeti a veritable smorgasbord of destinations are on offer. There are many operators in Arusha who will take you in their 4 x 4 Safari vehicles. They will organise your stay for you according to your budget. Tarangire Park, known for its elephant population. Lake Manyara, known for its tree climbing lions, elephants and baboons. Also in this area are the Colubus Monkeys. Ngorongoro Crater - very commercialised but still well worth a visit to see. Serengeti - Anything from lions to hyena to leopards cheetah and other plains animals. There are no permanent Lodges or camps in the Ndutu area. Special permits are granted to operators to have mobile camps along the riverbed. This ensures that the area remains as pristine as possible for the animals to enjoy. I went with a Tour Operator Maasai Wanderings who are based in Arusha. They have a mobile camp and the experience of bucket showers and buffalo grazing next to your tent at night is one for the books. www.maasaiwanderings.com. There are several other operators in the area and a quick search on www.tripadvisor.com gives one a load of choices. The most popular time to travel to Ndutu would be around February as it is then that the Wildebeest are calving and they tend to do so at Ndutu each year. However, it is extremely hot in February so a certain amount of discomfort will be experienced. 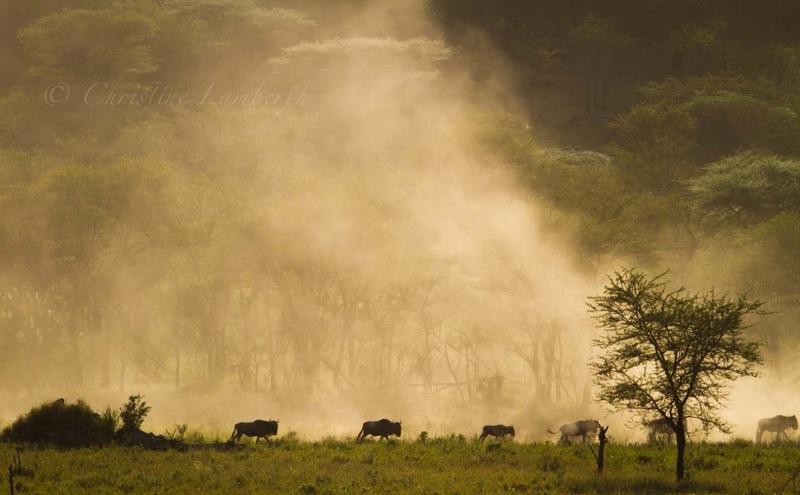 The wildebeest on the move creating clouds of dust. It is also very dusty in the area as a fine volcanic dust has settled over the whole river bed and as such camera equipment needs to have good covers to keep the dust out. Do not consider taking one camera body and interchanging lenses. Sensors will suffer. Get lenses onto cameras before entering the area and keep them firmly on the camera until your next destination. Consider taking along a light cotton scarf that you can wrap around your face to keep the dust off you. is brutal in February. Sunblock, hats, sunglasses, long sleeved shirts and even pants are highly recommended. Lots of face creams for your skin after you have bathed. You are more than likely to be in a camp where you will have a bucket shower. Water is in short supply in the area and the water is not potable. So the tap water provided can wash clothes and your body but drinking water comes from bottles. Your clothes quickly turn a better shade of brown and collars and cuffs will be dirty after just one day. It is therefore advisable to take along khaki gear that can be washed and hung out to dry but you will have to use your shower water to do this as there are no laundry facilities. Innovation is the name of the game. Armed with this knowledge you should be able to book yourself a trip to Tanzania’s most remote wildernesses. Don’t be put off by any of the discomforts described here, they are well worth the sacrifices you will have to make to experience what is one of the world’s most awe-inspiring destinations. If you would like to travel to Tanzania in a small, personal group with some photography/inspiration in mind, send me an email to christine@christinelamberth.co.za and you could travel with me on my next trip. There is nothing quite like the first time. The first time for anything seems to occupy its own little domain in the brain almost as if an extraordinary place is created within your head. And so it was with my first time for a cheetah kill. The cheetah in the distance. Tanzania’s Ndutu plains do not have a replica anywhere in the world. The vastness is difficult to describe. It is a flat, open space that appears to have no end. There are no hills or trees from horizon to horizon. This is not a place for the fainthearted or the foolish. Fortunately I am in a safari vehicle driven by a local Tanzanian who needs no directional instruction. She ignores our vehicle as she scans the horizon. The sun has just emerged from its slumber and the honey gold glow is gently spreading over the plains. Uncannily my guide spots some movement far off in the distance and he deftly manoeuvres the safari vehicle over the scrubby bush. The progress over uncharted scrubland is both exciting and alarming. 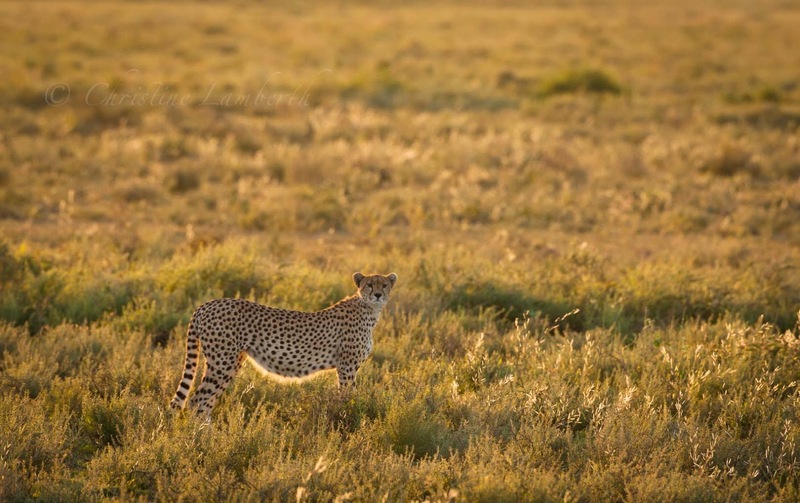 Visions of rocks and warthog burrows come to mind but in the moment it is only fleeting as all is focussed on the agile feline picking her way across the savannah. Each bush is examined carefully. Intent on her early morning search she completely ignores the approaching vehicle. She carefully picks her way through the scrub. At each leafy clump she carefully scans under and around the minuscule bush. 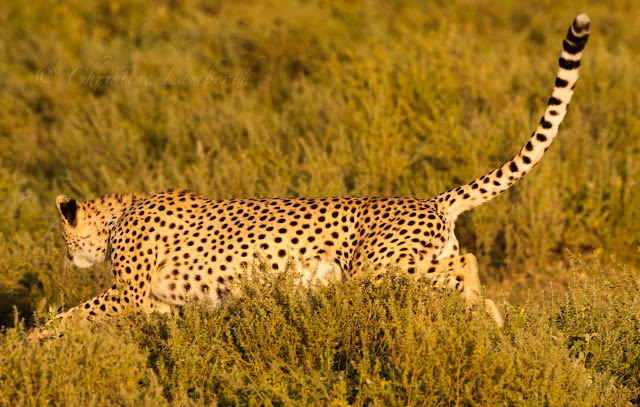 I have little time to admire the graceful sinuous movement as she investigates each bush. Suddenly she freezes, body taught, head down and then with alarming speed she rises in the air tail erect and the chase is on. Suddenly, she freezes looking intently into a bush. The object of her focus is a scrub hare who in turn is now making a determined effort to get away from the cheetah. 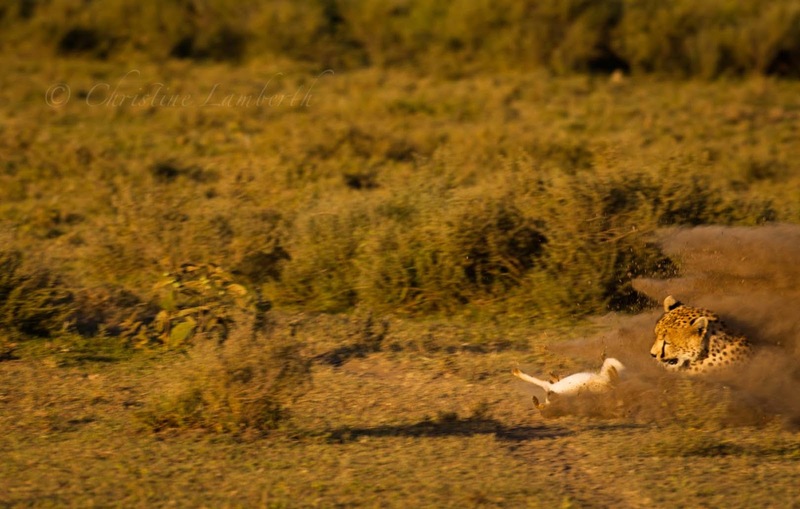 The hare darts erratically from bush to bush with the cheetah in hot pursuit. 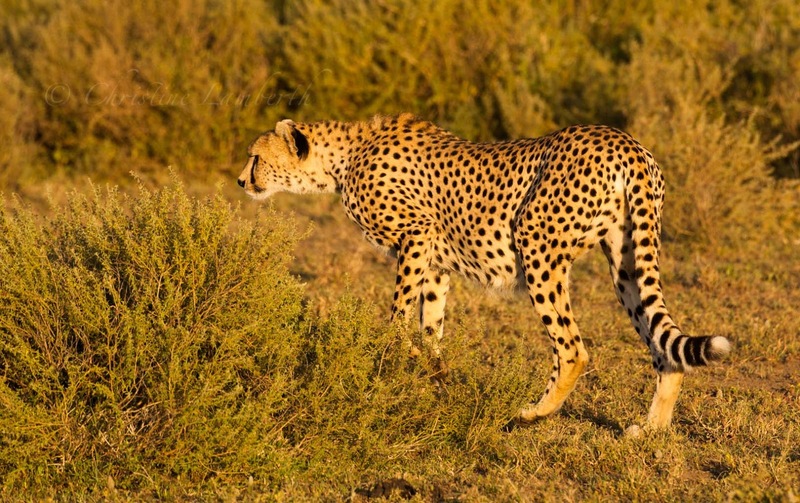 Each desperate movement from the hare is followed by the cheetah launching into the air pouncing down where the hare has just been. The inevitable happens when the hare runs out of cover from bushes and has to make a run for it. 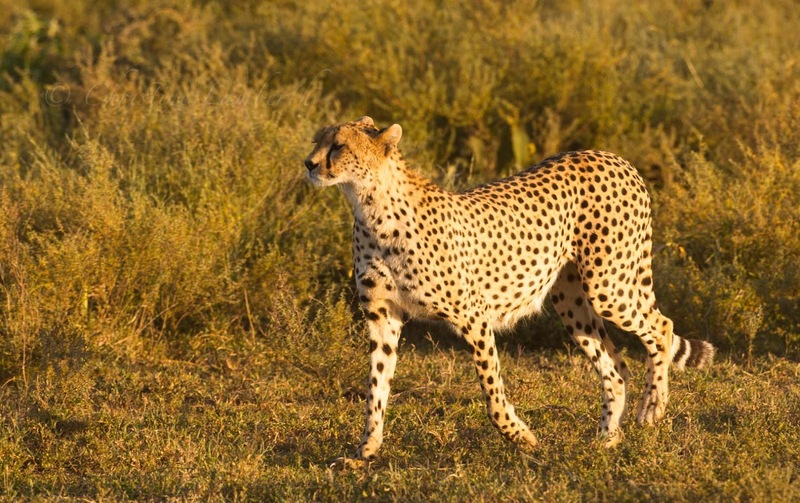 The superior speed of the cheetah comes into its own and in a billow of dust the hare flies into the air, legs flailing. The dustball envelopes both cheetah and hare and it is not too soon before our curiosity is sated. 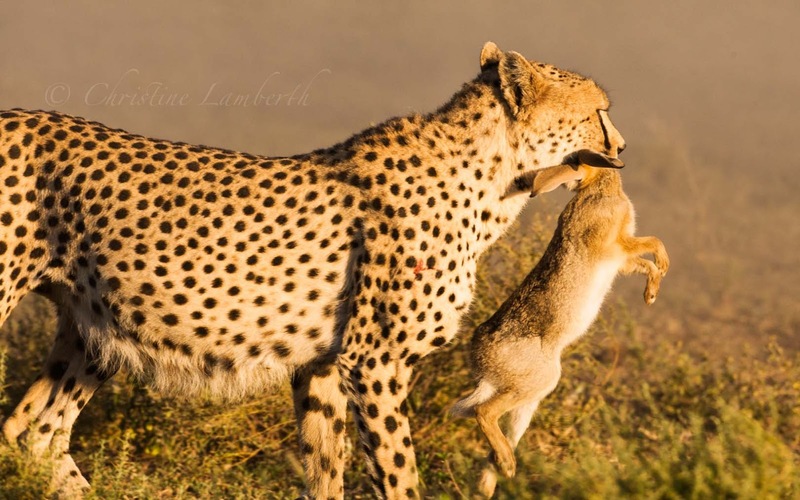 The cheetah emerges with the hare firmly gripped in her jaws. The lifeless body testament to the efficiency of a big cat’s mercilessness. 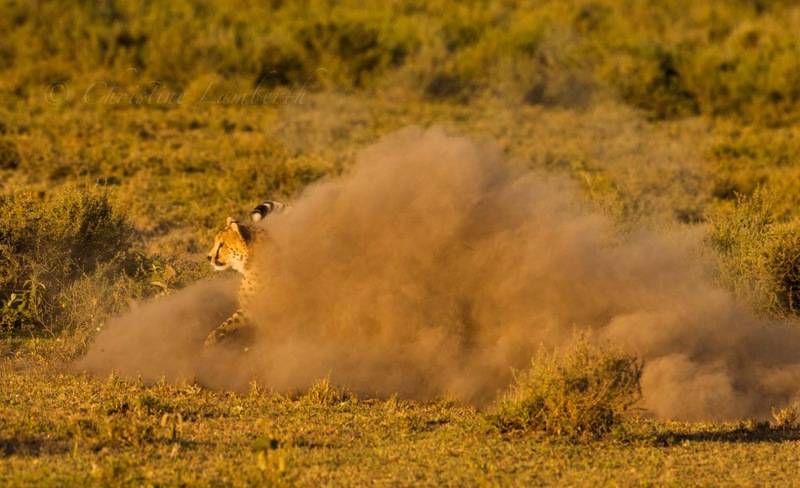 The hare and cheetah are enveloped by the dust. 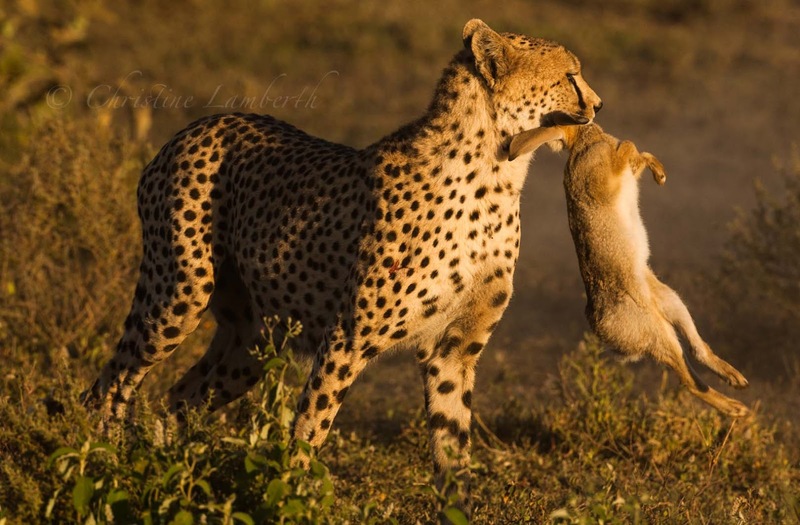 The Cheetah emerges with the hare in her jaws. She looks for a spot to settle down. We watch mesmerised as she finds a suitable site and settles down to devour her morning snack. As I reflect on what has just transpired I cannot but feel that I am incredibly privileged to be able to witness the raw beauty of Africa. After breakfast she sits in the sun for a while before heading off. October in the Kalahari is hot. Not just mildly hot, it is scorching. As such tents and other accommodation without air conditioning are stifling by midday. The only option is to find a spot in some sort of shade, make sure the little bit of air movement can catch you and then sit still. My plan is to wet my kikoi (a wonderful piece of cloth bought in Zimbabwe some years ago), take a bottle of water that I have frozen in my equally wonderful Engel fridge, place the bottle on my lap, throw the wet kikoi over my head and wait for the heat of the midday sun to pass. Sometimes, through some divine intervention, I manage to nod off and the time passes quickly. Today I am rudely awakened not only by the strident screeching of some starlings but by some urgent words. “If you want some shots you better get up fast”. The kikoi gets thrown to one side and without thinking I grab my camera. And then I look. In the distance, under a lonely tree there is a confrontation in progress. A Cape Cobra with its flashy yellow scales shining brightly in the sun is standing erect, head flared and body coiled. Standing just outside of reach is a pair of Yellow Mongoose who are determinedly harassing the reptile. I hotfoot it over to a nearby tent, throw myself on the cement plinth and watch through the lens. 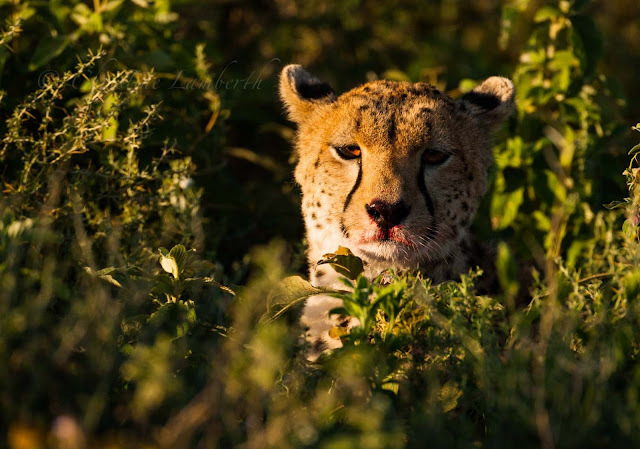 Anyone who has tried to take photographs in the Kalahari on a hot summers day at midday will know the challenges of what happens when the animals are in the shade and there is all that glare around. Poor camera, that has now to try to take readings from light to dark with the highest contrast of lighting possible. Besides fiddling with settings and focus etc I am fascinated. As the mongoose moves towards the snake it rears up and pulls in the hood slightly, then the mongoose back away again and the snake relaxes slightly flaring the hood again. The intimidation works and the mongoose lies down just out of reach. This is a dance, Kalahari style. Backwards and forwards, step to the side, step back and step forwards again. The footwork goes on for the better part of an hour before the snake starts moving menacingly forward. The mongoose does a quick little step again, this time backwards and the snake takes its chance and heads towards the dustbin that appears to offer a little bit of protection. The mongoose however has other ideas and darts forwards lunging towards the snake. The yellow scales are pulled back tightly as the snake makes a “run” for it. A nearby tent becomes the next haven of safety for the snake hotly pursued by the mongoose who is still a little wary. The snake rears up and spits venomously. The mongoose does a quick sidestep and the venom hits the ground kicking up a puff of dust. The Cobra desperately tries to bury itself under the tent but is not successful and it has to reorganise itself under the protection of the canvas. The mongoose still will not back away and there is another confrontation of reared heads and sidestepping. Finally the snake, seeing some rocks and bushes nearby, makes a desperate attempt to slither away. The mongoose still warily pursues the disappearing tail of the snake but it finds a convenient hole in the rocks and the excitement is over. No kill, but a lunchtime story to be retold. The Kalahari rocks! 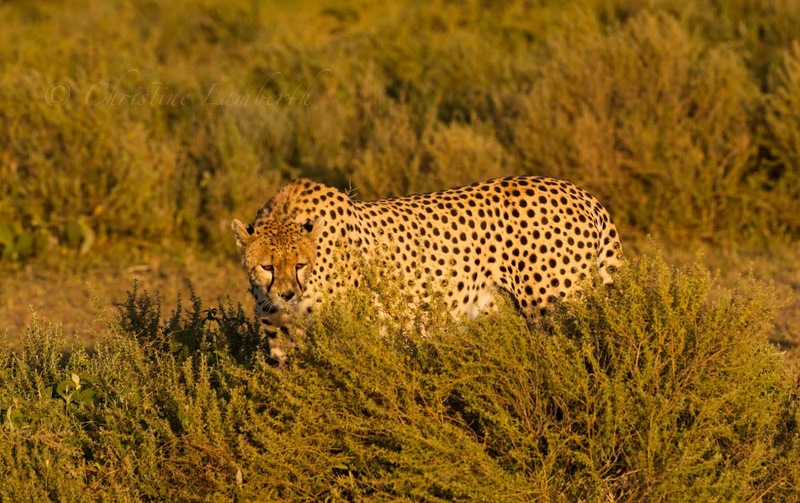 Kgalagadi Transfrontier Park Wilderness Camps. You should take note that this is an extremely popular destination and that you have to book 10 months in advance to get space. The time to log onto the booking system is on the first of the month at the beginning of the day.